Beleaguered array vendor Tintri has had to face reality with its latest falling quarterly sales and widening losses prompting drastic refinancing and restructuring action. Revenues of $28.9mn for Tintri's Q4 ended 31 January were down 29 per cent year-over-year – which did exceed Tintri's own guidance. Product sales (67 per cent of total) declined 41 per cent on the same period a year ago but services sales grew 24 per cent and deferred revenue was up 8 per cent year-over-year. It's not all bad news, though. There were 50 new customers brought on board in the quarter, taking the customer count to 1,540, a 31 per cent rise year-on-year. Product gross margin fell 59.1 per cent, below the hoped-for 62 per cent. This was due to lower product prices, including DRAM and NAND. The net loss was $37.4m, which compares to a $25.6m loss a year ago and and $51.68m in the previous quarter. The full year numbers show a revenue fall from $125.1m in fiscal 2017 to $123m in fiscal 2018. The net loss increased from $105.8m to $157.7m. These are pretty bleak numbers for what was supposed to be a growth company. 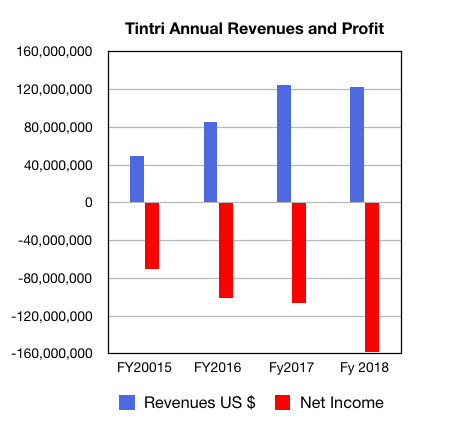 Every dollar received in sales cost Tintri $1.28 in costs. Cost-saving is going to intensify with a restructuring exercise to cut the cash burn rate. Total headcount currently is 445, with some 63 people already laid off to save costs. There will be a further 20 per cent global workforce reduction, about 90 people, completed by April 30 this year, and an early termination of a facility lease. Another major move will see chairman and CEO Ken Klein step down once a successor is recruited. In the Q4 earnings call, Klein talked about efficiencies, saying: "We've consolidated, for example, engineering and product management and obviously we consolidated sales under our worldwide sales leader." That refers to a new sales head, Tom Cashman, exec veep for global sales and alliances, who is promoted from being a senior veep. Tintri said it will become more efficient and targeted in its spending, focusing on high-performing regions and sales teams and three key use cases: VDI, test and development, and database virtualisation, to beef up sales. It won't slash and burn support, the firm said, wanting to preserve what it sees as an exemplary customer support capability. Total restructuring expenses are estimated at $6.2m to $7.2m, related to severance costs, a write-off of net leasehold costs, and contract termination costs. The company expects to recognise most of these charges in Q1 of fiscal '19. With the cuts, CFO Ian Halifax said he expects to reduce operating expenses by more than $70m and to approach operating cash flow breakeven based on planned revenue levels by the fourth fiscal 2019 quarter. Tintri had $32.3m in cash, cash equivalents and investments at quarter-end and has refinanced with $25mn in promissory notes issued to some existing VC stockholders, at 8 per cent interest per year and maturity in 18 months. Existing debt is being rearranged. Halifax said: "There are no plans to raise incremental financing this fiscal year." Referring to the refinancing and restucturing, William Blair analyst Jason Ader said: "Assuming some gradual stabilization/improvement in revenue, these two actions taken together should extend Tintri's lifeline for 18-24 months (without the need to raise more capital). This is not a small assumption though, and it will be difficult for investors to gain confidence that Tintri's revenue will start to recover after this massive cost-cutting action." In the call Klein said: "We continue to explore available strategic options to deliver value to our shareholders," and was asked about this by one analyst on the conference call. Obviously I think it will be very, very interesting to a lot of different companies in the infrastructure and cloud space based on a differentiated technology, based on our blue-chip customers, clean 20 per cent of the Fortune 100 and of course our talented employees. Tintri customers include marquee names such as AMD, Comcast, Chevron, NASA, Toyota, the US Marine Corps, and United Healthcare. William Blair's Ader viewed Tintri as an aquisition candidate. "Ultimately, we continue to make the case for a takeout, as Tintri's technical strength and blue-chip customer base ... could be attractive to a larger player with holes in its product portfolio." Klein came in as CEO to set Tintri up for an IPO. Instead it is generally considered, by sources, that Tintri fouled up its IPO and missed goals. Reg cries out into the voicemail void: Is anybody home?